March 1st is Dydd Gwyl Dewi, when Welsh people everywhere, and particularly so in the diaspora, celebrate the feast of Dewi Sant, (David, their patron saint). 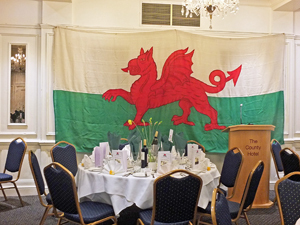 On Friday 2 March Chelmsford and District Welsh Society celebrated the event with the traditional grand dinner, held for the 55th consecutive year at the County Hotel. 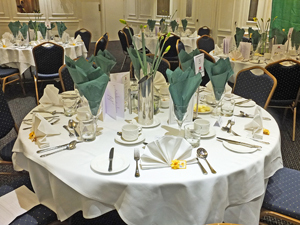 The room was beautifully presented, with tables dressed in white and green and decorated with daffodils, under the watchful gaze of the regal Ddraig Goch (the Red Dragon on the Welsh banner) as a backdrop to the top table. The rousing processional march, the Men of Harlech, played by the harpist Rachel Bartels, announced the entry of the Mayor of Chelmsford, Cllr. Duncan Lumley and the Mayoress, the Guest of Honour, the Rev. 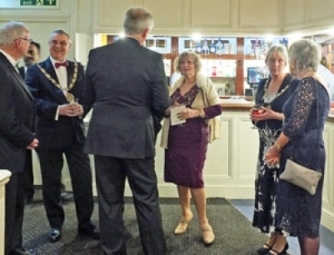 Peter Davies and Mrs Davies, escorted by the President Brian Farmer and his wife and by the Vice-president Ivy Price and her husband. Following the Grace, a fine traditional dinner of Cawl cennin a thatws (leek and potato soup), Cyw iar wedi’i rostio gyda lemwn a theim (roast chicken with lemon and thyme) and Cacen siocled tryffl gyda hufen ia mwyar duon (chocolate truffle cake with black currant ice cream), followed by coffi/te a petit fours was enjoyed. The Loyal Toast to the Queen was proposed by the President, and the Vice-president proposed the toast to Dewi Sant. The President then introduced the Guest of Honour, who delivered an excellent speech. He had enjoyed a varied and interesting career. 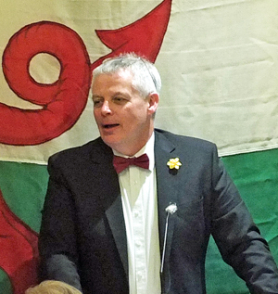 Raised in south Wales, he went to university in the north, after which he became a Social Worker, then a Probation Officer, before becoming a Baptist minister in churches all over Wales. He apologised for having an accent and dialect honed in all those regions and hoped he would be understood! He proposed a toast to The Society. In response, the President proposed a toast to Our Guests. 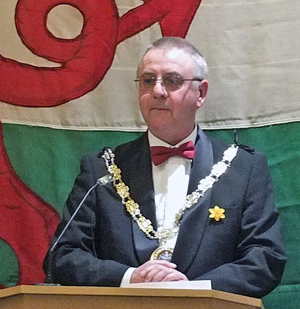 Responding, the Mayor congratulated the Society for its contribution to the cultural life of Chelmsford by arranging the annual Male Voice Choir concert featuring choirs from all over Wales. 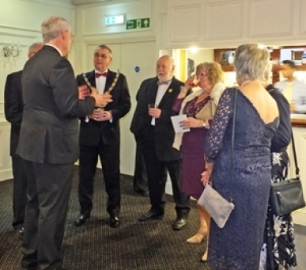 The Society has also raised more than £40,000 for local charities over the past few years. 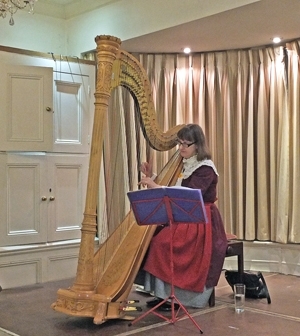 The evening ended in the traditional manner with Rachel playing Welsh airs on her harp followed by some audience participation. 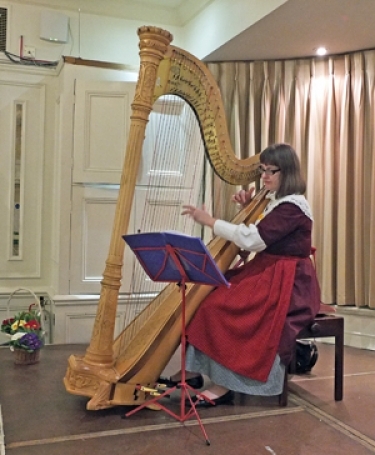 The President thanked Liz Armishaw, Kay Bright and David Brown for organising such a successful evening, Shirley Moody for providing the flowers for the tables, Rachel Bartels the wonderful harpist and Gwil Williams for being an excellent MC. 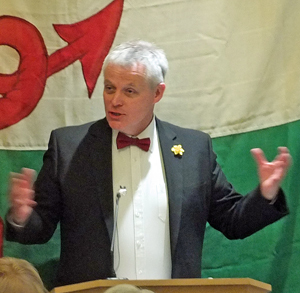 Finally the strains of the National Anthem, Hen Wlad Fy Nhadau resounded around the room. Eighty two members and guests had been expected to attend, but for the first time ever, the severe weather conditions of “the beast from the east” prevented many from venturing out. 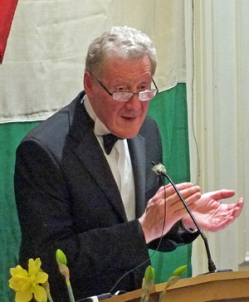 The Rev Peter Davies, the Guest Speaker, had driven from near Neath in South Wales in hazardous conditions the day before the dinner, and Rachel Bartels, the harpist, had arrived at 11 am, having driven from Loughton to be certain of attending the Dinner! Both are due grateful thanks. 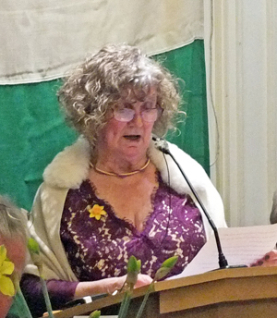 The annual St David’s church service at Little Baddow URC was cancelled, for the first time ever, since it was feared that the road conditions and steep and narrow country lanes would prove to be too hazardous. 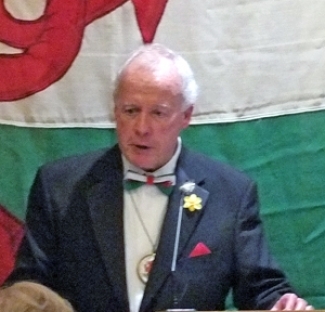 During the service it is traditional to dedicate the last hymn, Seintiau Cymru, to the memory of Society Members who have died during the past year. This year, the dedication would have been to David Henfrey, Elizabeth Peters and Frank Hatch.